The installation of LUCEM Light Transmitting concrete and/or LUCEM 'pure concrete' can be done similar to the dry fixing of natural stone. A space behind the LUCEM panels is mostly required for the light sources. Regarding safety and/or local building regulations, the DIN 18516 1-5 is the basis for most applications. The choice of a suitable installation method always has to consider the light source and the local heat changing conditions. In any case, with artificial or with natural light sources, everything which is in between light source and LUCEM panels will create a shadow on the other side. If shadows of the subframe should be avoided, the subframe design has to be done accordingly. For most cladding applications, undercut anchors are a good choice, as they only create a 6 mm shadow, which is nearly invisible. For free standing solutions, metal frames can be used. In special cases like interior furniture, also fixing with silicone only may be applicable. Flooring can be done as a raised floor system with transparent feet or with a LED-panel directly placed below the LUCEM floor panel. Undercut anchors allow the fixing with a nearly invisible shadow. 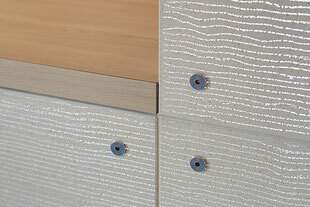 In some cases visible screws might be a design element itself. 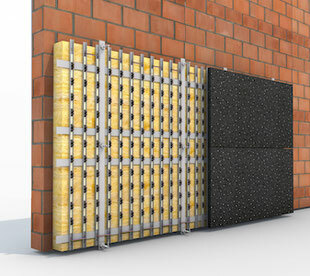 Separation walls made with LUCEM panels can be made with a metal frame for example. 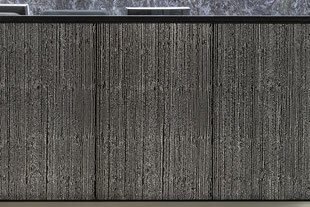 For furniture applications, sometimes a fixing with natural stone silicone is applicable. 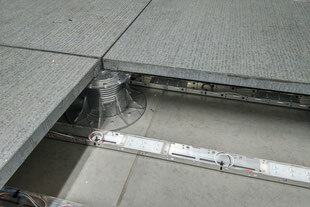 LUCEM floors can be made as a raised floor system or directly placed on LUCEM LED-panels. LUCEM provides tailored light solutions for each application.